Lori Popadiuk spent her childhood in Vancouver trolling the alleys with her Granddad looking for cast-off materials to make cool things with. 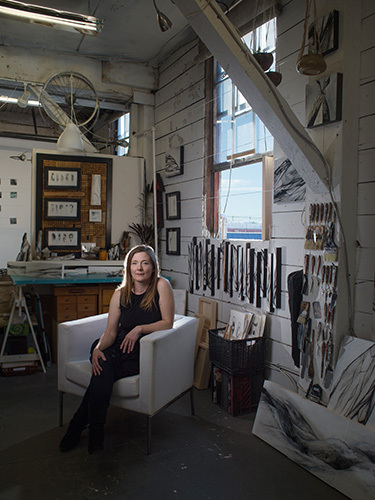 Her creative path began at this early age and eventually led her to study fine art and interior design at Kwantlen Polytechnic University and the British Columbia Institute of Technology. By uniting the two crafts she gained wide recognition within the design world, mainly for her body of work Birch. In 2015, Popadiuk engaged in a 6 month sabbatical in the Netherlands where she focussed on deconstructing her approach to painting. Allowing and encouraging this transformation of process, her work evolved dramatically while maintaining her signature elements of movement, texture and depth within a defined palette. The techniques Popadiuk now employs are varied and spontaneous, harnessing the attributes of acrylic paint, charcoal, pencil and ink. Popadiuk’s new works have also evolved thematically, moving into expressions of personal revelation. They evoke complex dichotomies of calm and chaos, rebellion and obedience to create work that lies close to her heart. Her work is available through her representatives or from her studio in the Parker Street Studios in Vancouver, Canada.